Environmental Noise Control designed and fabricated approximately 800 linear feet of temporary K-rail mounted noise barrier panels. ENC’s panels stopped unwanted noise from impacting the daily lives of residents as the City of Carson works to clean up the environment. This project utilized our STC-32 acoustical noise blankets. 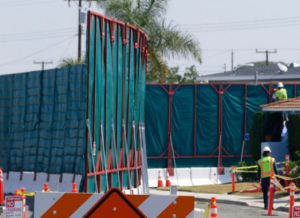 American Integrated Service came to Environmental Noise Control when the City of Carson, CA, contracted them for a landmark soil-remediation project. Their work entailed placing pipelines underground at approximately 36”-46” to channel the extracted soil materials out of the contaminated soil. Significant excavation and improvement to existing properties is also part of the plan, which encompasses at least 27 phases of work. Throughout the excavation, pipeline drilling and soil remediation, American Integrated Service was concerned about the noise from heavy equipment and work affecting local residents. 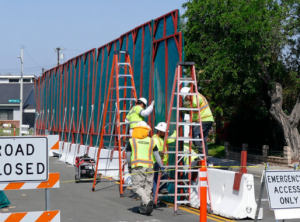 Environmental Noise Control designed and fabricated approximately 800 linear feet of temporary K-rail mounted noise barrier panels that will be used throughout the span of the project. The ease of these barriers will allow for on-site positioning for the most effective noise blocking and absorbing. The panels utilized ENC’s proprietary STC-32 blankets with a green overlay. The sound control systems put in place have been widely accepted and appreciated throughout the neighborhood. ENC’s panels stop unwanted noise from impacting the daily lives of residents as the City of Carson works to clean up the environment. K-Rail mounted frames with ENC’s STC-32 blankets. Installation of ENC’s K-Rail mounted noise barrier panels.